CNG: eAuction 438. IBERIA, Bolskan. Circa 80-72 BC. AR Denarius (19mm, 3.90 g, 11h). 438, Lot: 9. Estimate $100. IBERIA, Bolskan. 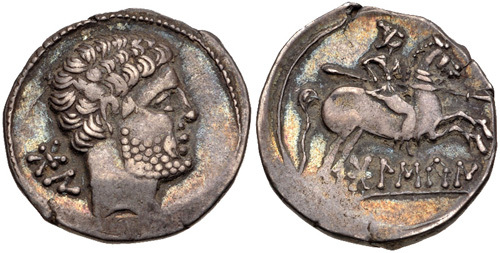 Circa 80-72 BC. AR Denarius (19mm, 3.90 g, 11h). Bare male head right / Warrior on horse rearing right, holding spear. ACIP 1423. VF, toned, light deposits, some die wear on obverse, a little off center on reverse. Ex Archer M. Huntington Collection (Vico 132, 14 November 2012), lot 109 (part of; HSA 1001.1.7218).